This week, our students participated in a one-of-a-kind activity. EC Washington English Center students, accompanied by our brilliant teacher Cecilia, went to the Game Lab at The American University and learned about educational game design. 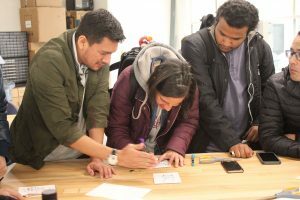 The students had the opportunity to interview American University graduate students about their games and even learned how to make circuits themselves! Certainly a first for most of our students. They designed unique drawings around the circuits and made them light up. The results were amazing and everyone had a blast learning English in an unconventional way. Students learned vocabulary about making video games and practiced their interview skills with the graduate students. This activity allowed our students to use practical English skills while having fun together. As souvenirs, all of our EC Washington English Center students were able to keep the circuit drawings they designed! Thank you so much to Cecilia for helping to plan this incredible field trip and thank you so much to everyone who took part!